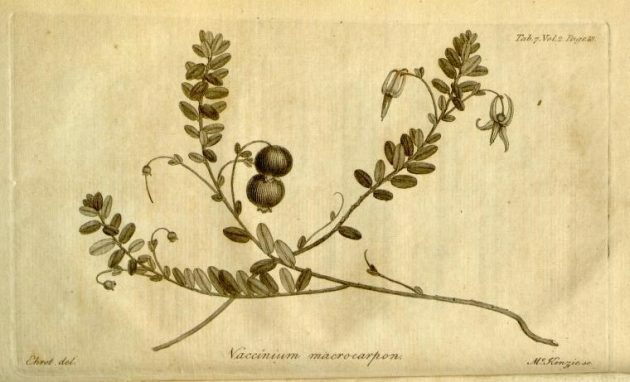 This illustration of a cranberry plant appears in the 1789 book “Hortus Kewensis or A catalogue of the plants cultivated in the Royal botanic garden Kew,” by William Aiton’s (volume 2), Smithsonian Libraries copy. Long before colonists landed on the shores of New England, Native Americans harvested cranberries from peaty bogs and marshes. Following the Pilgrims reliance on the fruit, cranberries became vital for North American fur traders and explorers during the long winter months. The plant was named “craneberry” by Europeans for the resemblance of the berry flowers in June to the sandhill crane. Today, is there a food in North America more intrinsically linked with the landscape of the past and nostalgically intertwined with a holiday feast than the cranberry? From Cranberry Lakes in Nova Scotia, Cranberry River of West Virginia, Cranberry Pond in Sunderland, Massachusetts, the Cranberry Isles of Maine, Cranberry Mountain in New York, Cranberry Meadow in New Jersey, and many a Cranberry Bog dotting coastal areas, the plant deserves the appellation of First or Founding Fruit.